If you’re suffering from a chronic case of winter cabin fever, but it’s WAY too cold to think about doing anything outdoors with your dog, 8 Chains North Winery in Waterford is the answer. 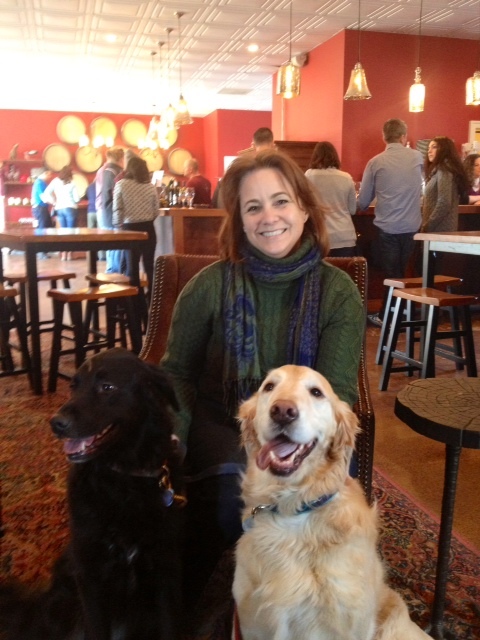 It’s another Northern Virginia winery that welcomes dogs inside their tasting room as well as on the grounds. Adding to the high canine-comfort score, 8 Chains has built a fenced-in area for dogs to romp off-leash. There are a few picnic tables in the enclosure, so owners can relax with a glass of vino while keeping an eye on their pup. The play area sits alongside the covered patio and open yard which overlook the vineyard where Sauvignon Blanc and Albariño grapes are grown. In the tasting room there are a couple of cozy seating areas with deep leather chairs, one in front of the large stone fireplace and one next to a picture window with sunny southern exposure. There’s also a private party room and a gallery wall featuring the work of local artists. Tastings are $8 for five wines. Surprisingly, my favorite was the least expensive, an $18 Vidal Blanc, Traminette and Sauvignon Blanc blend called LoCo (for LOudoun COunty) Vino. I highly recommend doing the chocolate pairing option for $5 more. Each wine is paired with an elegant artisan truffle from Leesburg chocolatier Abby Rose Confections. My pairing included Salted Caramel, Lemon Honey, Orange Spice and Raspberry truffles. 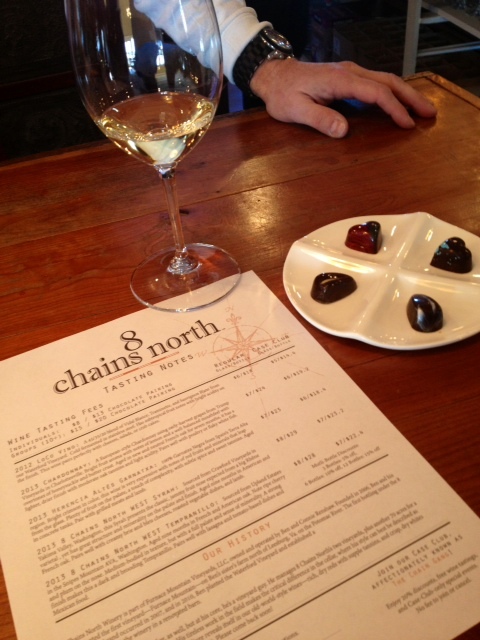 Gourmet chocolate and wine can make anyone forget record-setting wind chill temperatures! 8 Chains is open Thursday-Monday, and located at 38593 Daymont Lane, Waterford, VA 20197.